As we look forward to 2011, we are excited to share that we are making great progress on the expansion of Disney California Adventure park. The year 2010 has been very exciting. In June, we made a big splash with “World of Color,” the nighttime spectacular that is wowing guests every night. On October 29, we reached an exciting milestone with Cars Land with the topping out of the Cadillac Mountain range – about 125 feet in the air. And, many of you have seen The Little Mermaid ~ Ariel’s Undersea Adventure and Goofy’s Sky School coming to life along the parade route. Both are scheduled to open in 2011 along with new restaurants and shops as we finish the entire Paradise Pier expansion. Now, as we move toward a new year, expansion continues. In January, our efforts move to the front of the park. On Jan. 4, we will begin making way for a new entrance modeled after the legendary Pan-Pacific Auditorium. 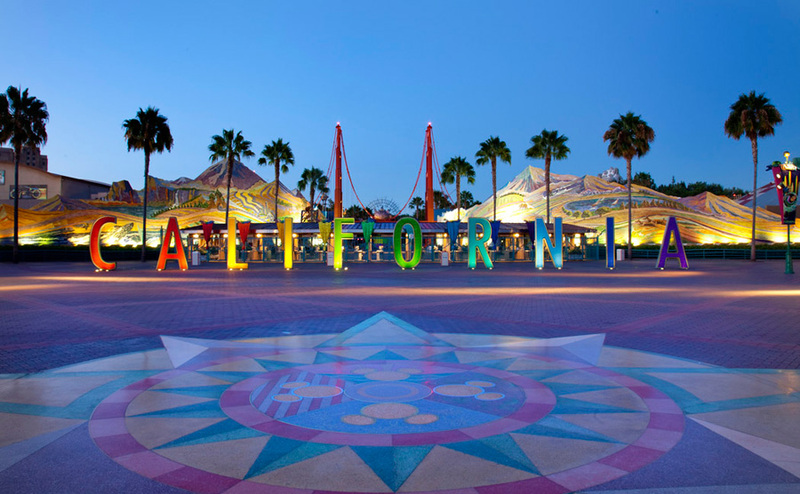 This means, the “CALIFORNIA” letters will be removed, and we plan to save these icons for possible future use. Now’s the time to get your photos! As this work continues, we are making adjustments to the Disney California Adventure Main Entrance area, including relocation of some Guest service areas. We’ll keep you informed about those here on the Disney Parks Blog as soon as we have specific dates and locations. Also on Jan. 4, we will begin the transformation of the Sunshine Plaza area into Buena Vista Street inside the Main Entrance. When complete, it will represent Los Angeles as it was when Walt Disney arrived on the west coast in the 1920s.